Flightseeing around Nimpo Lake, Anahim Lake and Tweedsmuir Par in British Columbia. 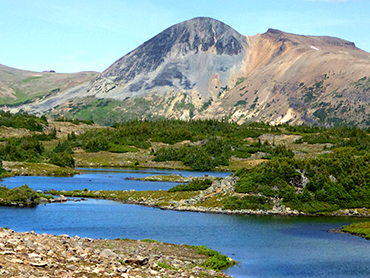 See the Magnificent West Chilcotin by Floatplane! There's lots of opportunity to go flightseeing around Nimpo and Anahim Lake. Since so much of this vast wilderness is inaccessible to man, the best way to see it is from a float- plane! See magnificent mountain ranges, such as the Coastal Mountain Range to the west and south, which includes Monarch Mountain rearing up nearly 12,000 feet above sea level, and the massive ice fields over which it towers. 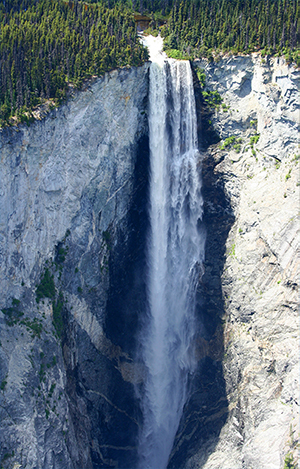 Hunlen Falls is the third highest free falling water fall in Canada at over 1000 feet and empties from the northern end of the Turner Lake Chain to drop into famous Lonesome Lake far below. 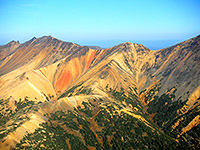 Fly over the Rainbow Mountain Range that sports the unusual reds, yellows and pinks from mineral deposits resulting from ancient volcanic activity.You may get the opportunity to see goat and woodland caribou roaming among the high, rolling alpine valleys vividly painted with wild flowers. Most accommodations hosts will be happy to arrange any of these activities for you. Floatplanes are commonly used here and will allow you the opportunity to access a great deal of country otherwise inaccessible to man. The planes can take you into remote mountain lakes where you can hike alpine valleys and explore the incredible bounty of wild alpine flowers, many not seen anywhere else in the world. They can also help you access lakes such as the Turner Lake Chain where you can canoe the chain for several days or hike the trailhead at Hunlen Falls. Or just go flightseeing where you can look down on snow - capped peaks and huge glaciers, plunging waterfalls, and wild mountain lakes. Just seeing what glaciers alone can do to change the landscape is fascinating! 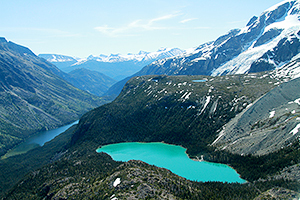 So little of the habitat has been disturbed by man in this vast wilderness overlooking the West Chilcotin that wildlife is abundant and provides plenty of opportunity for wildlife photography and there's no better way to take pictures of snowcapped peaks, huge glaciers, alpine flowers, remote lakes and plunging waterfalls than from the air! If you would like to canoe, river raft, kayak, go hiking or mountain climbing, or get into the back country for landscape or wildlife photos, then quite often the only way to access where you want to go is by floatplane. 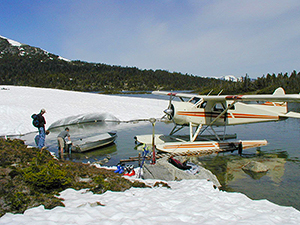 Two charter services operate out of a floatplane base at Nimpo Lake. Cost of a flight is determined by the type of aircraft used and the total number of passengers (including gear) being flown. 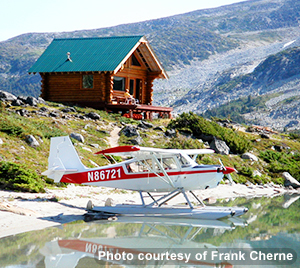 For those of you who own or operate your own floatplane, this is the perfect floatplane place to be! There are several calm bays and docking facilities on Nimpo Lake, and access to fuel for your plane at Wilderness Rim Resort. 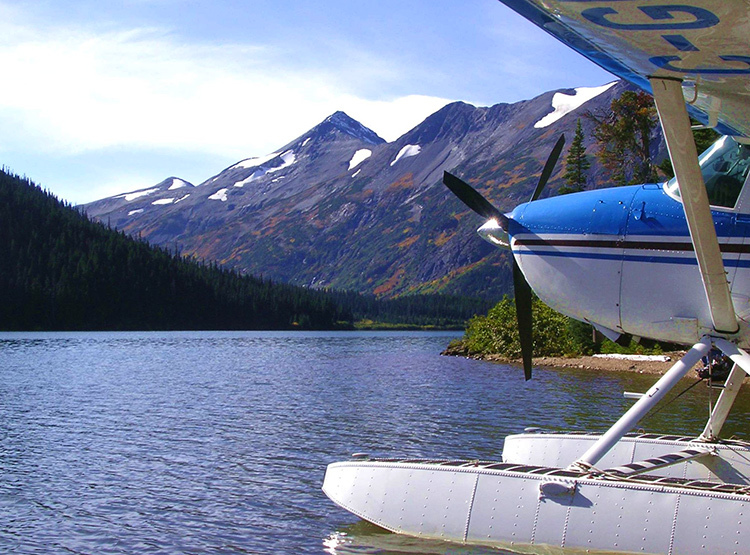 Nimpo Lake is a well known stopping off point for those pilots of private planes headed to Alaska or the Yukon. 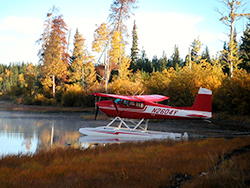 Pilots often stop off at Nimpo Lake on their way to Alaska or the Yukon. For those of you who have come to this area for fabulous fishing, floatplanes are your friend! If you would like to cast a fly line or troll a lure in a remote alpine lake, the only way you will get there quickly, is by plane. Many of the local resorts and lodges have boats and motors located on the fly-in lakes, and in many cases, outpost cabins as well. 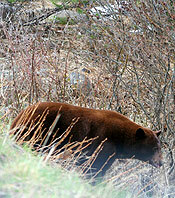 Many of the alpine lakes and streams have hard fighting native Rainbow Trout, while some have Cutthroat and Cut'bows. And if you fly out, you will often have the whole lake to yourself! So whether you're a boating enthusiast, or a 'dyed-in-the-wool' fly- fisherman, give yourself a treat. Fly into some of the most beautiful country in British Columbia, for some of the most exciting fishing you'll ever encounter. Oh, and don't forget to bring your camera!